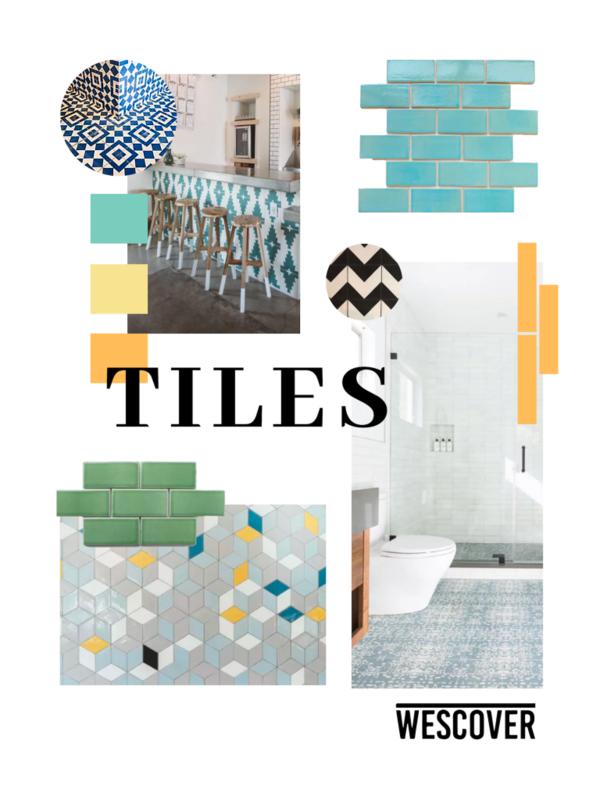 Whether you’re dreaming of a sleek subway tile kitchen or a Parisian black and white hex tile bathroom, tiles are versatile in style and function making them the ultimate decorative material for any surface. These small ceramics are durable and their colors don’t fade or wear off like paint. They’re easy to keep clean and sterile too. The more you know about tiles, the more you’ll want to use them. But what tiles are right for your space? We love these tiles because they’re great inspiration for a new room or how to incorporate tiles to refresh an existing space! All these Creator’s have their own unique styles and this is just a taste of all the tile work on their Wescover maps! 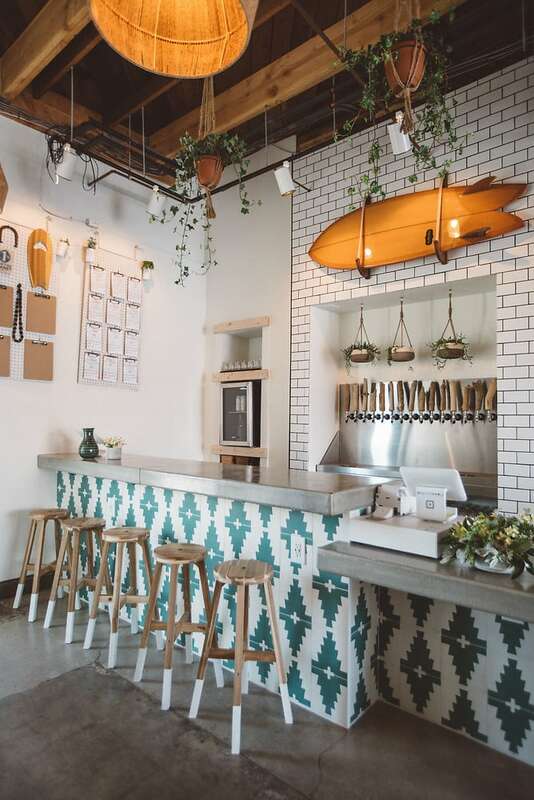 Parquet Tile in Sea Green by Fireclay Tile at Mister Jiu’s in San Francisco. As seen on Wescover. The French “parquet pattern” is traditionally a geometrical and angular mosaic of shapes (like herringbone tiles). 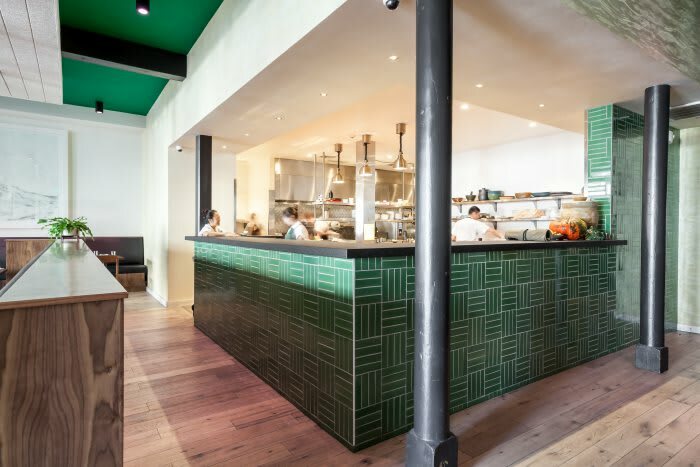 We love Fireclay Tile’s take on the pattern in Mister Jiu’s restaurant in San Francisco as these sea-green tiles make this already refined space feel imperial. Chevron Grand by Cement Tile Shop at Noon All Day in San Francisco as seen on Wescover. These tiles made by Cement Tile Shop for Noon All Day cafe in San Francisco give it’s floor a retro feel that takes you back in time. The light and airy feel it brings to the cafe’s floor is perfect for putting you in the mood for Noon All Day’s pastries and cakes. New West Pattern by clé tile at JuneShine in San Diego, CA as seen on Wescover. These New West tiles by clé tile really give this space a modern Western meets SoCal feel, “the clé new west collection of cement tiles is a collection with roots in the wild, wild west, but with a vibe that’s everything new.” Seen at JuneShine bar in San Diego, under a bar or countertop is often an underutilized area for artful tiles. 12W Blue Bell by Mercury Mosaics at Bluestone Lane in New York City, New York. As seen on Wescover. 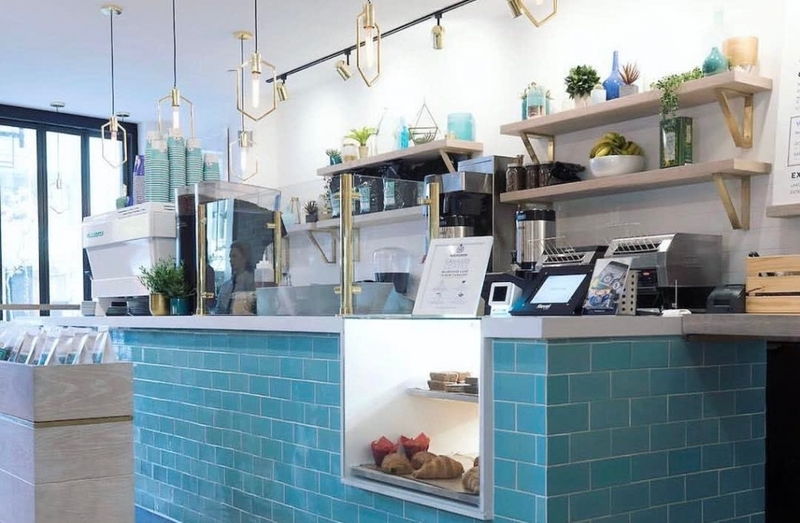 These 12W Blue Bell Subway Tiles were custom-made by Mercury Mosaics for Bluestone Lane cafe in New York City. In the context of the rest of the space, they add the perfect pop of color to create a happy, laid-back feel. 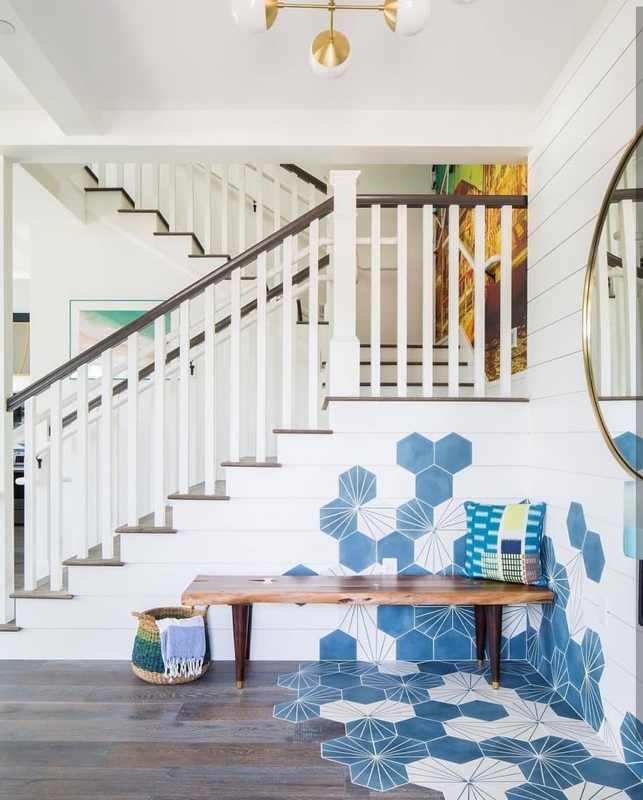 Omaha Kinship Cement Tile by Eskayel at a private residence in Los Angeles, CA as seen on Wescover. 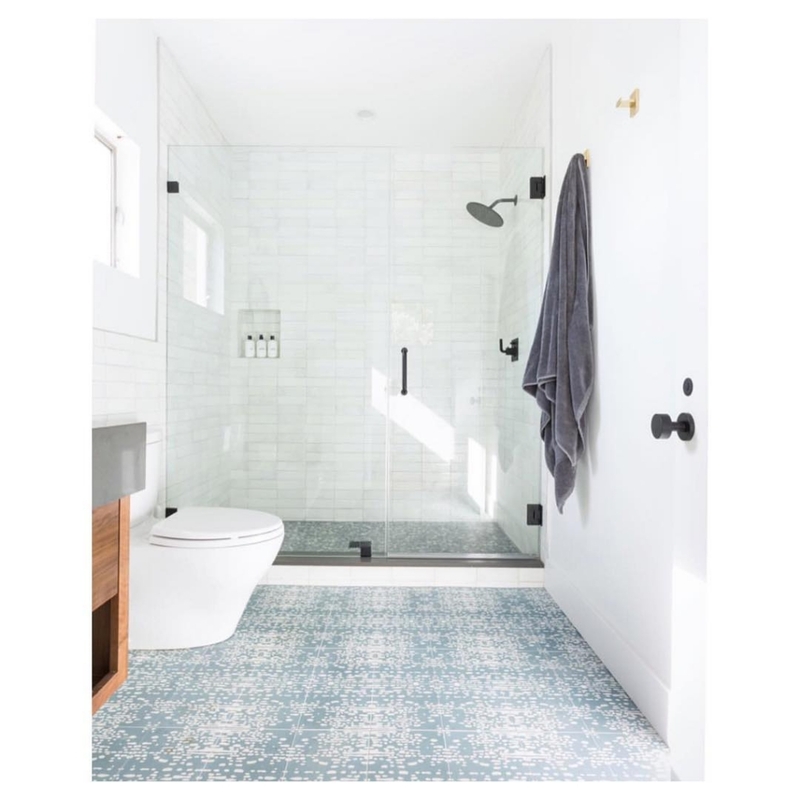 Inspired by the Kwoma Tribe of Papua New Guinea, the pale blue and white tile designs make this bathroom floor feel eclectic and clean. Eskayel made this tilework for a private residence in Los Angeles, CA in collaboration with cle tile. Bachelor Farmer Cafe Tile by Mercury Mosaics at the The Bachelor Farmer Cafe, Minneapolis, MN as seen on Wescover. The colorful, bold shapes give you something to look at as you sit on a stool to sip your coffee. 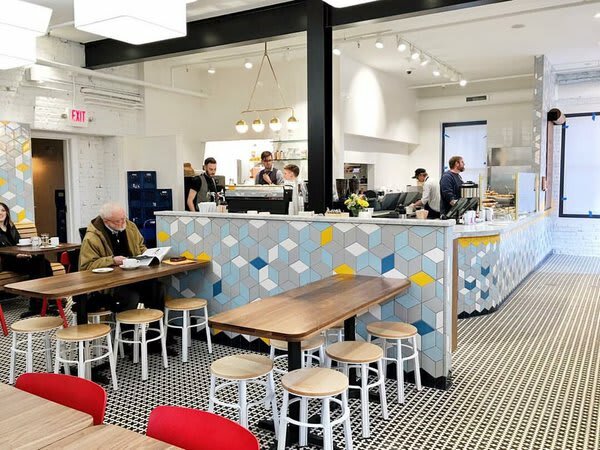 This geometric tilework by Mercury Mosaics is featured in The Bachelor Farmer Cafe in Minneapolis, MN. 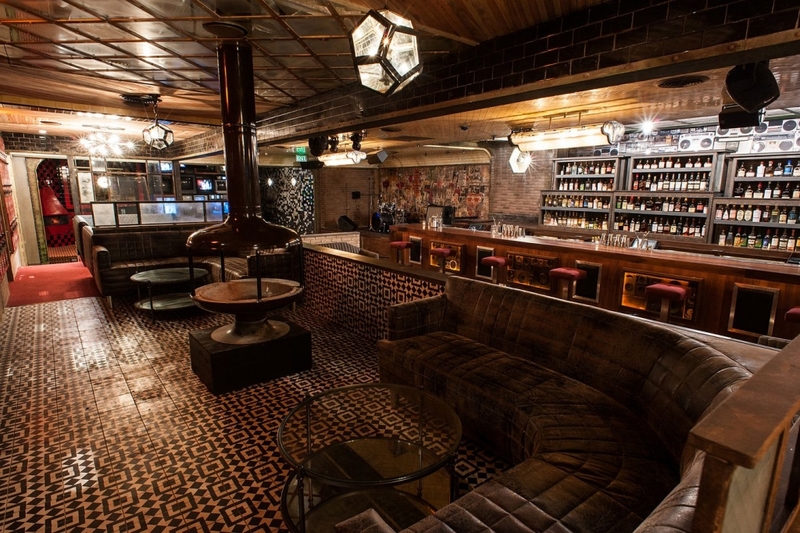 Fez Cement Tile by Granada Tile at Break Room 86 restaurant in Los Angeles. 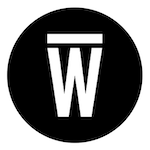 As seen on Wescover. These geometric Fez Cement 928 B tiles are part of Granada Tile’s Morrocan tiles from their Echo Collection. 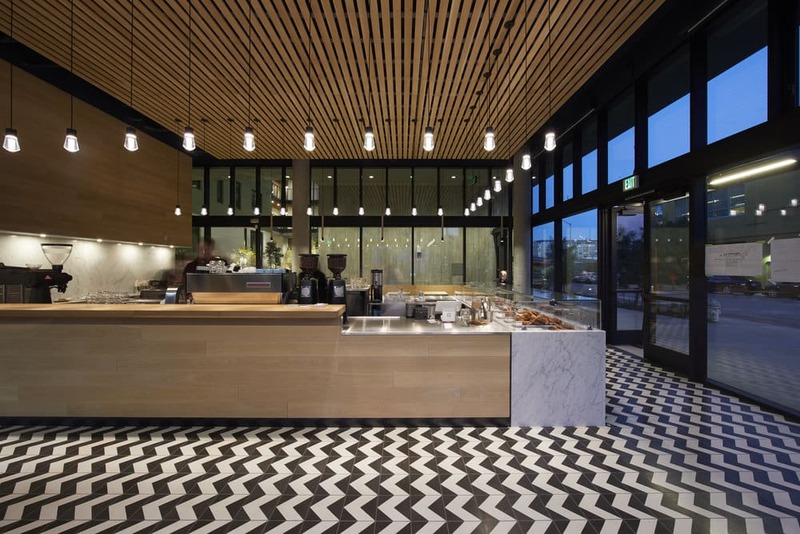 The bold geometric shapes and intricate patterns in these tiles are bringing a taste of Morroco that mixes traditional craftsmanship with a contemporary feel to the floors Break Room 86’s restaurant flooring in Los Angeles. Granada Tile’s Echo Collection features similar tiles to this in multiple color variants including cerulean blue, red, orange and green.